Michael Ausiello: Where are you channeling all that ‘Dark Renee‘? Where is it coming from? Annie Wersching: Wow… I dunno, some horrible childhood that I don’t remember or something? *laughs* The scripts this year are amazing, and it’s really fun to play something so different from last year. Michael Ausiello: A lot of talk today about 24 maybe coming to an end this season. 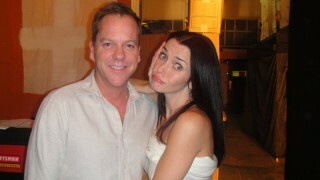 Do you think Jack and Renee are soulmates or have the potential to sorta have a happy ending? Annie Wersching: Well… Happy ending, I dunno about cause it *IS* 24 and I don’t know that happy endings really exist on this show *laughs*, but I definitely think they have a really strong interesting connection that they were able to make in only one day. They went through such crazy traumatic experiences together and saved each other in more ways than one. So I think they definitely have — I dunno soul mate — but they definitely have a pretty interesting connection. Michael Ausiello: Did you watch the show when Audrey and Jack were ? Michael Ausiello: What do you think, Audrey vs Renee?